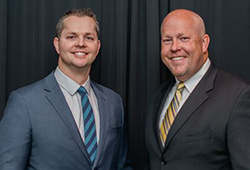 June 13, 2018 | 11:45 a.m.
Now, almost two decades later, Sam '03 and Matt '02 have become donors themselves, establishing the Jo Lynn Lacy Scholarship at Bethel University. The scholarship, created in honor of the Lacy brothers' mother, is meant for first-generation students who are acquainted with trauma and tasked with paying for their own education. "We were those things," Sam says. "My brother and I understand uniquely what it means to try to go to college without parents to walk you through it or resources to do it." While Sam and Matt were young, it wasn't uncommon for their home's power to be shut off. Their younger brother had cancer-twice. Their parents divorced and got back together. But none of this seemed out of the ordinary. Among the working poor, Sam says, life was hard. Although Jo Lynn-whose own opportunities for education were limited-didn't have the resources to point her sons in the direction of college, she did point them in the best direction she could: upward. "My mother told me that just because I came from poor white trash didn't mean I had to be it," Sam says. "She told me I could lift myself up from my humble origins and do something different." Sam met his future roommate, Minnesota native Tim Adams, while volunteering at a Young Life camp in North Carolina when he was 19. Adams invited him to visit Bethel a whopping 975 miles north of the Lacy brothers' Texas hometown. Moved by the welcome they received when they arrived in Minnesota, Sam and Matt packed up to study and play football for the Royals. "The teamwork we experienced through football provided a true foundation for our faith, and now we're able to carry that on into our workplaces," says Matt, who is an executive at a publicly traded logistics company in Texas. There's not a single day that goes by that I don't think of my undergrad." "Bethel radically transformed us," Sam adds. "I felt like I had the smartest professors in the world who cared about me and spent time with me. It changed my life and gave me a new imagination for what I could do and who I could be." After graduating with a biblical and theological studies degree, Sam went on to earn a Master of Divinity and a Master of Arts in Christian Education from Princeton Theological Seminary, completing a yearlong Fulbright Research Fellowship in Germany shortly thereafter. He's now finishing his Ph.D. in American legal and religious history at the University of Pennsylvania and works as an attorney with Jones Day, a global law firm with a Minneapolis office. For Sam, it's clear that his path wouldn't have been possible without a steady flow of scholarships. Although he's finally in a position to be the one giving money instead of receiving it, he's quick to clarify that the Jo Lynn Lacy Scholarship is a two-way street. "It's not giving back," Sam says. "I need just as much exposure to the version of me at 19 as this generation of 19-year-olds needs my money. I'm in a position to give, but in return I am moved and changed and helped by these students' efforts and successes." Learn more about how Endowed Scholarships can advance Bethel's mission .